Tui has a fleet of about 150 aircraft, including 15 of the grounded Boeing models. A further eight 737 Max planes are due for delivery by the end of May. The financial hit is due to the cost of aircraft replacements, higher fuel bills and other disruption costs. Tui will use eight older Boeing 737s, plus spare and charter aircraft, to "guarantee" customer holidays. It said it would take a €200m hit should Boeing 737s resume flights at the latest by mid-July. However, if in the coming weeks it looks as though the planes will not be flying by mid-July, Tui said it would extend the measures it was taking until the end of September, costing the firm another €100m. Boeing grounded its entire global fleet of 737 Max aircraft earlier this month after one of the planes, operated by Ethiopian Airlines, crashed, killing all 157 passengers and crew. The grounding of the 737 Max was inevitably going to prove costly for the airlines using it. To avoid cancelling services, they have had to look around for replacement aircraft. 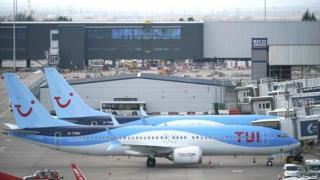 Tui says it has had to use spare planes in its fleet, extend leases that were due to expire - and hire in extra planes. This has largely been done by so-called wet-leasing, where an aircraft is provided ready to use, with a flight crew. It's not cheap. A wet lease can cost upwards of $3,000 per hour. Fuel is also an issue. The main selling point of the 737 Max was its low fuel consumption. Using older, thirstier aircraft is inevitably going to cost more. These losses are not covered by insurance - though Tui admits it will be holding talks with Boeing. So although safety is undoubtedly their first priority, companies using the 737 Max will be very keen to see the aircraft back in the skies as soon as possible. In a statement, Tui said: "The group is utilising spare aircraft of its fleet, extending expiring leases for aircraft that were supposed to be replaced by 737 Max aircraft, as well as leasing in additional aircraft." A spokesman said Tui could not get insurance to cover this type of eventuality. However, Tui has a good relationship with Boeing, and has new aircraft on order, so should be able to recoup the cost in some form. Tui said: "No dates have yet been announced for modifications of the existing aircraft model by the manufacturer, neither for approval of such modifications by the Federal Aviation Administration and the European Aviation Safety Agency. "Therefore, Tui has taken precautions, along with other airlines, covering the time until mid-July, in order to be prepared for Easter, Whitsun, and start of the summer holiday season and to secure holidays for its customers and their families." Tui shares initially fell more than 8% following the announcement, before recovering some ground to stand 5% lower. "Tui's 737 Max-related profit warning announcement feels like a watershed moment," said Nick Wyatt from analytics firm GlobalData. "It marks the first time that a company directly affected by the grounding has spoken publicly on the impact it expects the grounding to have and it doesn't make for good reading. "Tui had 15 of the affected aircraft in operation and the likes of Southwest Airlines, Air Canada, American Airlines, China Southern, and Norwegian all had more. "Given this, Tui's warning is unlikely to be the last and the impact for airlines that need to cover a greater number of grounded jets by both extending leases and taking out new ones will be even more acute."